Spring fever is raging across the nation, with symptoms including (but not limited to) thorough cleaning, remodeling, and home re-birth. If you’re feeling a bit “feverish” but don’t have a lot of cash to invest, you’re renting, or simply don’t feel confident about a big renovation right now, there are plenty of small things that can be done to refresh your home. The kitchen sink is a great place to start! 1. Replace your old flange and basket strainer! Is your existing sink flange all scratched and just doesn’t look nice anymore? Does your basket strainer clog things up more than it strains? 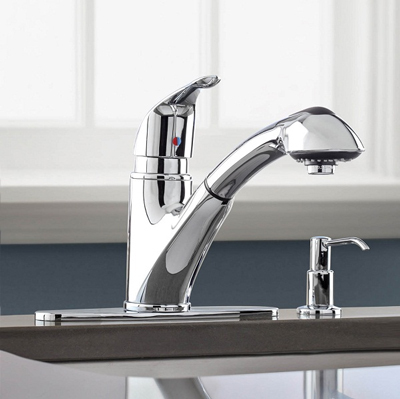 Have you recently upgraded your faucet or other fixtures and now realize the flange doesn’t match? Whatever your reasons, installing a new sink flange and basket strainer is a simple process that will quickly update the look of your kitchen sink. Usually all you need to do is unscrew the locknut underneath the sink and pop the old flange up, then add the new flange. Easy-peasy! Learn how to replace a Kitchen Sink Flange on YouTube! 2. Add a soap or lotion dispenser! If you have an extra faucet hole on your sink, consider using it for a soap or lotion dispenser. It takes only a few minutes to install, and you’ll have a sleek, clean look with less clutter around the sink. You’ll also save money by buying your favorite dish soaps or hand lotions in bulk – with the added benefit of cutting down on plastic waste! Let Carolyn show you how to add a dispenser here! 3. Install an undercounter water filter! Enjoy the refreshing taste of filtered drinking water without having to spend a fortune on bottled water. Most point-of-use filtering systems fit easily under the sink, and can be installed in an afternoon by a proficient do-it-yourselfer. Sure, this may be a bit more expensive than adding a soap dispenser or switching out a flange, but in the long run you’ll be saving money, helping to reduce waste associated with bottled water, and treating your family to delicious, pure water. These are but three of the simplest ways you can give your kitchen a refresh without a huge investment of money or time. What other ideas do you have for making the kitchen more convenient, functional, or fun? Previous: Have You Hugged Your Plumber Lately? Where can I find more information on water purification articles ?